Classic Heuers: Heuer 844 French made diver. Heuer 844 French made diver. This is one of the first Heuer made diver watches. The 844 model was made for Heuer in 1979-80 in France by G. Monnin. This was the first trial run for Heuer into the divers watch market. Heuer did not think it would be worth while tooling up for something like that so they purchased already existing models in France. As you can see the divers watch market was very successful, that they started to gear up in 1980's with swiss made movement. 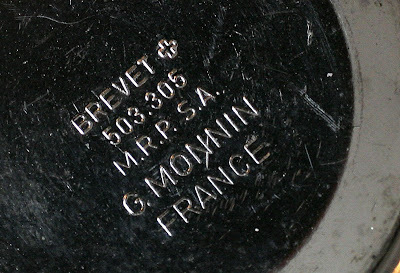 The dial is printed with "MADE IN : FRANCE" on the bottom, and say : "METRES" and : "PROFESSIONEL" as opposed to : anglicized "METERS" and "PROFESSIONAL" versions of that. The hands are of cathedral type. There is also red 24 hour numeral on the dial. The case back is plain with no Heuer logo. 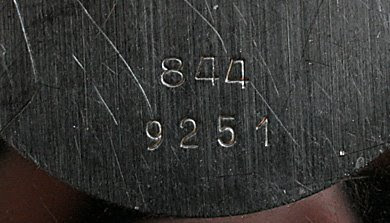 And is stamped 844 rather crudely. 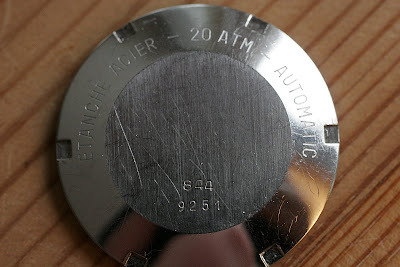 "ETANCHE ACIER - 20 ATM - AUTOMATIC" is also stamped around the edge. 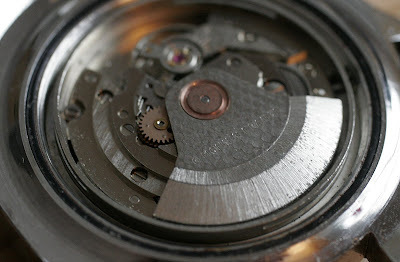 The movement is Felsa FE 4611A and is signed G. Monnin France on the rotor. Later Swiss made Heuer divers have movements from ETA. Inside of case back is signed G. Monnin France. It's a full size 42mm big diver with 24hour dial and screw in unsigned crown. I like it a lot. Looks cool on a NATO strap. I really want one of these.. and the orange dial is indeed very,very cool. Thanks Marius, the French diver has now got a new home. But the orange one is a keeper. I will not sell that one. I have now made a post about the orange diver. timothy alicea (huxtable32) i just bought one> in real nice condition's i hope all is well with it. Hi Timothy. Congrats, great watch. I'm shure you will enjoy it. 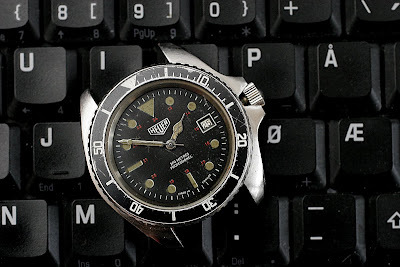 It's been a long time since you have posted at the heuer forum. Jarl- some very nice photos here of the 844- I used one in a post on my blog about the 844/ 980/ TAG Heuer 1000. I'm not 100% certain, but I've recently learned that the movement might not be a Felsa, but a French Ebauche - hence the 'FE' in FE4611. I've been told that Felsa was a Swiss manufacturer. Maybe the confusion comes from the 'FE' being mistaken for Felsa Ebauche? I have a Heuer diver's, Quartz marked 844. Same as automatic, with French markings, orange 24 hour, series 844, but quartz. It must be the prototype quartz watch. HI, I have a Heuer French 844/12049 and learned alot about it from your site. My problem is that the bevel is missing and my jeweler told me he couldn't get a replacement. Do you know where I can get a bevel for my watch. For the short time I've had it, it seems to run very well so I would really like to get the right bevel for it. Can anyone direct me to a source to obtain. Thank you. Jerry S.
I have a 844 automatic from 1979 with the Monnin movment. The crown was replaced, now I cannot set the time or date. A typical Tag Heuer design, I've seen some of variation of this... in any case you're lucky coz' you have this collector's item. 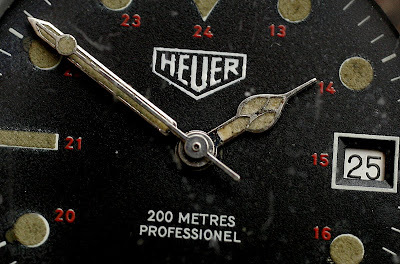 Hi in 1979 i bought my Heuer i cant see any name on rotor and in the back i have the brevet+ bit but not the makers name but i do have a tiny inscription above right of + it is so small even with a magnafing lens i just cant work it out i can see letters and numbers on two lines. Got one of these as a gift from an auction Heuer 844 8499 (i am assuming the later is production number).. finally decided to dust if off and look it up.. looks like i found a gem! Crystal is scratched but everything else is good. Face has cathedral arms, Heuer lgogo , 200 Metres Professionel, Made in France (small along the bottom). I just bought an Alfex 844 quartz. It looks EXACTLY the same as the Heuer 844, except for the hands and ofcours the Heuer logo. On the back of the case I see etanche acier 20atm, 844 and the serial number. Can you tell me something more about this watch? Heuer Swiss made diver. The back is marked 6130 W 20 and 980.006 20 atm quartz acier etanche. Can you give me any information on this watch please? I have a Heuer quartz acier etanche 20ATM, 980 025, 6298W20 black ladies watch, purchased early 80's, never used, would like to know value? Email me: Renee_Camarillo@yahoo.com. Thank you! André: Your Alfex is most likely the same watch as the Heuer made by french watchmaker Monnin. Monnin made these watches for several different watch firms. 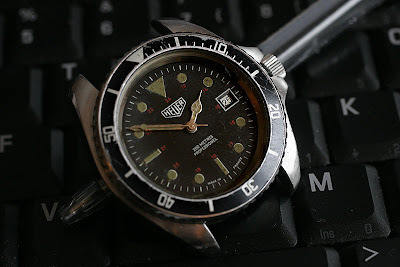 Chris: You have one of the most popular big sized vintage Heuer divers. The black dialed 980.006 is the most common one, but none the less popular among collectors. The was made in the early 1980s. There's also a TagHeuer version from the late 1980s. Rene: Ladies diver watches is not very popular among collectors. I recon around USD 200.00 at the most. More if you have the Heuer box. how much this watch cost ? I have a "Le Forban''. I would say that is exactly like Heuer (in fact Heuer is exactly like Le Forban). The case back inscription, movement, case, crown, etc etc everything shows that Heuer bought the entire watch from French. My question is: which watch is worth more? Heuer (which is a replica of Le Forbam, or Le Forban which is in fact the original? I confirm what I have read above "FE" means "France Ebauche". And by the way, pictures on your site are great !